Krystal is a family and friends owned and operated chauffeur company founded in 2013. When the two young entrepreneurs arrived in Austin, Antonio and Daniel noticed one big issue with the Austin chauffeured industry – The service sucked. They witnessed chauffeurs were often under dressed, unclean vehicles were the norm, and drivers regularly arrived late. Antonio and Daniel have been friends for over 20 years. Growing up in the city of Tyler, Texas, they moved to Austin in their twenties to start their ground transportation business. Growing a company has presented many challenges. Any company with two hard driven founders, with different temperaments, will face ups and downs. Both these young entrepreneurs have unique talents and understanding each other’s strengths and weaknesses has allowed them to overcome all the challenges of launching a new company. Thom Singer is a keynote speaker and professional master of ceremonies. 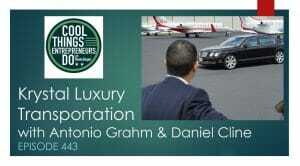 He is also the host of the “Cool Things Entrepreneurs Do” podcast and the author of 12 books.